Alicia Rosello grew up in Brussels and is now studying a PhD at University College London funded by Public Health England researching antibiotic resistance in care homes for the elderly. 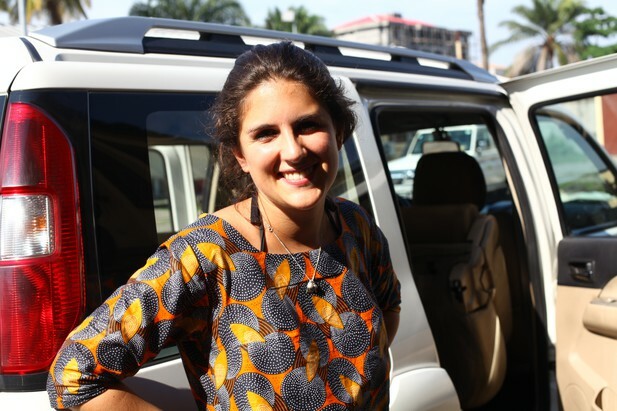 She has also worked on studying Ebola outbreaks in the Democratic Republic of the Congo. Alicia Rosello. Image credit: Marc Baguelin. What attracted you to studying epidemiology? During a placement year in my undergraduate degree I worked in multiple sclerosis research, obtaining patient blood samples at outpatient clinics and analysing their immune cells in the laboratory. The time I spent at the hospital and with medical researchers made me realise that I wanted to work in human biology, so I decided to study the virulence of Staphylococcus aureus during my final year undergraduate project. I found learning about infection fascinating but working in a laboratory was a bit lonely. I then studied a Masters in Public Health, which introduced me to many aspects of public health, including epidemiology. I was particularly interested in using statistical and mathematical techniques to help answer public health questions relating to infectious diseases and I chose to pursue this interest in my PhD. My thesis is about antibiotic resistant bacteria in care homes for the elderly. Bacteria can become resistant to a particular antibiotic, which means that the infections they cause (such as urinary tract infections) can no longer be cured by using that particular antibiotic. Resistance to many antibiotics is common, making the number of antibiotics that are effective worryingly small. This is an important problem, as there are very few new antibiotics being developed. I am particularly interested in infections that are caused by antibiotic resistant bacteria in care homes, as elderly people that live there are more vulnerable to these infections. What fuelled your recent publication in eLife? Last year, I undertook fieldwork in Kinshasa in the Democratic Republic of the Congo (DRC) funded by the Fischer Family Trust. In this project, organised by the London School of Hygiene and Tropical Medicine in partnership with the Institut National de Recherche Biomédicale in Kinshasa, my colleague Dr Marc Baguelin and I went through the historic archives of the outbreaks that occurred in the country and met some of the world’s experts in controlling outbreaks of Ebola. What were the main findings in your eLife paper? We compiled information collected during past outbreaks of Ebola in the DRC into a database that would be useful to others when studying the disease ( Rosello, Mossoko et al., 2015). From this information, we derived three main findings. Firstly, people between 25 and 64 years of age were most likely to be infected by the Ebola virus, and individuals aged under 5 and over 15 were more likely to die than those between 5 and 15. This finding could help target age groups for vaccination when it is not possible to vaccinate the whole population, for example, due to vaccine shortages. Secondly, outbreaks that started with a reproduction number (the average number of people an infected person passes the disease on to) larger than three tended to be shorter. However, when the reproduction number was lower than three, national and international organisations were slower to respond to the signs of the outbreak, leading to longer-lasting disease outbreaks. This highlights the importance of speed when responding to Ebola virus disease, even if few cases occur at first. A key way to meet this aim is to disseminate information about the disease, even in remote locations. Thirdly, delayed admittance to hospital once symptoms had started, even by one day, was found to increase the likelihood of death, thus showing the importance of rapid hospitalisation. I am currently working on comparing the frequency of antibiotic resistance in urinary tract bacteria from elderly care home residents with that of elderly adults living in the community. I am also looking at the seasonality of these infections within care homes. In the final year of my PhD I aim to build a mathematical model that replicates the transmission of these bacteria as care home residents move in and out of hospitals. This could help establish what type of interventions could help decrease the number of infections caused by antibiotic resistant bacteria. What has been your best moment during your research? The fieldwork I undertook in Kinshasa last year. One of the projects I carried out during my PhD was conducting a literature review. Although, in hindsight, this task was essential for understanding the previous research carried out in the field, screening abstracts was time-consuming and tedious. Dr Ute Meier (Blizard Institute, Queen Mary University of London) was my supervisor during my undergraduate placement. Her passion for her work is contagious and she taught me that it’s important to work on something that makes you want to wake up in the morning. She also taught me that in science one should always keep in mind the bigger picture and she encouraged me to celebrate the small things such as submitting a paper (as you never know if they will result in publications!). She is an extraordinary scientist and person who has made a big mark on all of her students both professionally and personally. Dr Sarah Deeny (Public Health England and the Health Foundation), one of my PhD supervisors, has also shown a genuine interest in supporting my career development. Without her recommendation I would not have had the opportunity to carry out the work on Ebola virus disease. She is a remarkable professional who has offered me unselfish help and guidance through the first years of my PhD. The efficiency of the publication process could be greatly improved. Researchers currently spend a large amount of their time submitting, editing and re-submitting papers to journals. Although peer review is necessary to ensure the accuracy and rigour of publications, the overall publication process takes away valuable time from scientists that could be spent conducting research. I think good supervision is a great part of the success of an early career scientist. I’ve been lucky both during my placement and my PhD to have supervisors that have had a contagious interest in their subject area, have shown genuine interest in my career and encouraged me throughout. I have lots of passions outside of science. I love cooking and have my own cooking blog; I also like painting and photography. I constantly want to learn new things and develop new skills. For example, I’ve recently started to learn sewing, swing dancing and surfing! Yes, but I have many hobbies outside of work so I try to make time for them. I haven’t got that quite figured out yet, but I’d like to continue studying the epidemiology of infectious diseases. I started out my degree in Biology wanting to be a marine biologist.